The dynamic-expressive styling of the GLC Coupé concept was a centre of attention at its world premiere in 2015 in Shanghai. It unites the typical stylistic elements of a coupé with the design language of current SUV models. Just one year later, this promise has become a reality: the new GLC Coupé translates the design idiom of the show car, with its distinctive basic structure and stretched greenhouse, virtually unchanged into series production. At the same time, the sports car among Mercedes-Benz’s mid-size SUVs impresses with its brand-typical safety, modern assistance systems and an especially sporty-dynamic character. The as-standard sports suspension as well as more direct sports steering, DYNAMIC SELECT and 4MATIC permanent all-wheel drive with 9G-TRONIC nine-speed automatic transmission combine effortlessly superior ride comfort with decidedly sporty agility. Two suspension variants with continuously adjustable damping are optionally available: the new DYNAMIC BODY CONTROL with steel springing as well as the already familiar AIR BODY CONTROL multi-chamber air suspension. Both options make for further enhanced driving dynamics and comfort. A clear clue to the vehicle’s distinctive SUV heritage is given by the optionally available side running boards. Flush with the outer edge of the body, wide wheels up to a size of 50.8 centimetres (20 inches) together with ample ground clearance underpin the GLC Coupé’s sporty-dynamic ambitions on unpaved tracks and unsurfaced roads. The styling of the rear end gives added emphasis to the vehicle’s coupé genes. With its pronounced shoulders, muscular bumper design with integral exhaust tips and underride guard in the form of a diffuser, the wide rear end of the GLC Coupé underlines the vehicle’s athletic looks while enabling the Coupé to hug the road. Narrow, split tail lights, a centrally positioned brand star and a sharp spoiler lip reflect a design that made its debut with the S-Class Coupé and which all Mercedes-Benz coupé models have since followed. Relocated to the lower section of the bumper, the number plate as well as the typical form of the rear window with its rounded upper area are among the further stylistic features. Like the headlamps, the night design of the LED tail lights sports the typical light signature of Mercedes-Benz. Uniquely in this market segment, the suspension can be equipped with fully supporting multi-chamber springing and electronically controlled, continuously adjustable damping. The AIR BODY CONTROL air suspension combines excellent driving stability and optimal comfort with sporty agility. Specific characteristics are preselected depending on the DYNAMIC SELECT settings. In Sport+ mode, the occupants feel as if they are sitting in a sports car with a high level of lateral dynamics due to the even stiffer suspension, which is lowered by 15 millimetres. COMFORT mode ensures an especially comfortable ride with soft suspension. To guarantee maximum possible driving safety also in this mode, the spring/damper forces are instantaneously adjusted, for example in case of a sudden evasive manoeuvre. Further benefits of the system include reduced roll when cornering, automatic load sensing and lowering of the load compartment sill by 4 centimetres for more convenient loading and unloading. Another key parameter for the sporty characteristics of the GLC Coupé compared with the classic GLC SUV is the retuned Direct-Steer system, which, with 15.1:1 (GLC: 16.1:1), offers a more direct steering ratio together with even sportier characteristics of the power assistance in the SPORT and SPORT+ modes. 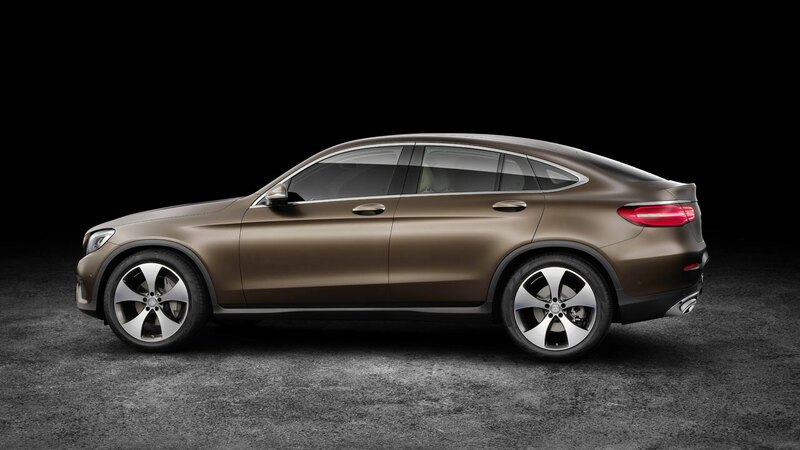 The design has also bestowed superlative aerodynamics on the new GLC Coupé. With a cd value of 0.31 and a drag area of 2.53 m2, the Coupé clearly leads its segment with cd x A = 0.79. Apart from the vehicle’s streamlined basic form, this exceptional aerodynamic performance also results from a host of detail solutions, such as sealing of the radiator and headlamp surrounds, a radiator shutter and optimised underbody panelling. Despite generous exterior dimensions and a long wheelbase – both of which benefit especially the occupants and the luggage compartment – as well as a full equipment configuration, the vehicle weighs in at just 1710 kilograms (GLC 250 4MATIC Coupé), which puts it among the leaders in this market segment. The main contributory factor in this is the all-new body, which features an intelligent mix of materials, comprising aluminium and high- to ultra-high-strength steels. Aluminium components additionally reduce the weight of the suspension, which also benefits ride comfort due to the attendant reduction in unsprung masses. The optional, fully supporting AIR BODY CONTROL multi-chamber air suspension features spring elements in lightweight yet robust glass-fibre-reinforced plastic, which reduce the system weight in comparison to conventional air suspensions. The use of the new compact transfer case as an add-on module and the 9G-TRONIC with its magnesium transmission housing results in a 12 kg weight reduction in comparison to the previous versions installed in other models. The new GLC Coupé is available in a total of eight model variants: customers can choose between four diesel and four petrol engines, including a plug-in hybrid as well as a powerful Mercedes-AMG model. The entry-level models are the four-cylinder diesel-engined GLC 220 d and GLC 250 d 4MATIC coupé with outputs ranging from 125 kW (170 hp) to 150 kW (204 hp) as well as the four-cylinder petrol engined GLC 250 4MATIC coupé rated at 155 kW (211 hp). Market launch will be in the autumn with these engine line-ups. Further models will follow at the end of 2016. With the GLC 350 e 4MATIC Coupé, Mercedes-Benz also offers a plug-in hybrid that combines agile all-wheel drive with extremely low fuel consumption and exhaust emissions: with a top speed of 235 km/h, the mid-size SUV emits just 59‑64 g CO2/km* with a system output of 235 kW (320 hp), thus setting a new best-in-class value. The semi-electric vehicle can cover up to over 30 km in zero-emission all-electric mode, accelerating to 100 km/h in 5.9* seconds when needed, courtesy of the boost function. For dynamically minded coupé fans, the Mercedes-AMG GLC 43 4MATIC Coupé is the right choice: this powerful top-of-the-line model comes with perfect on-road performance, dynamic styling and an attractive equipment package. The V6 biturbo engine puts out 270 kW (367 hp), accelerating the coupé to 100 km/h in less than 5* seconds. As different as the eight GLC Coupé models may appear at first glance, they are all characterised by high efficiency as well as compliance with the EU 6 emissions standard. 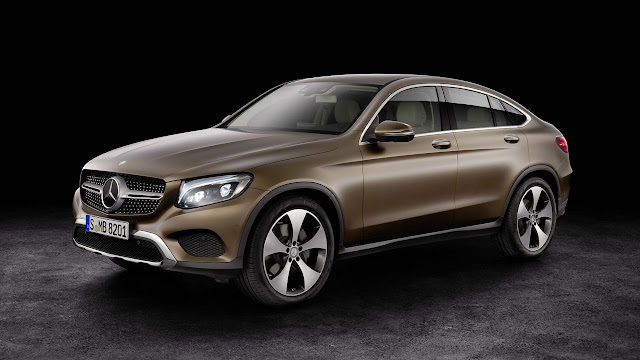 Most models come with 4MATIC all-wheel drive, while, with the exception of the plug-in hybrid, all variants of the GLC Coupé are equipped with 9G-TRONIC nine-speed automatic transmission. The GLC 350 e 4MATIC Coupé uses the 7G‑TRONIC PLUS transmission, which was specially optimised for the needs of a hybrid vehicle. The dynamic-expressive styling of the GLC Coupé concept was a centre of attention at its world premiere in 2015 in Shanghai. 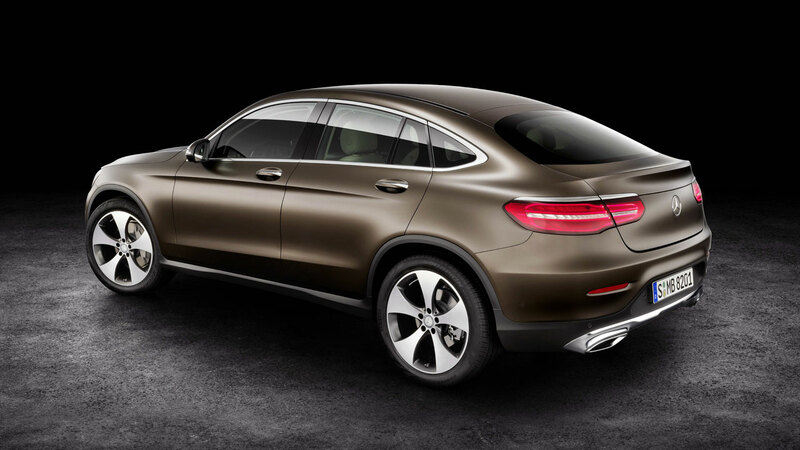 It unites the typical stylistic elements of a coupé with the design language of current SUV models. Just one year later, this promise has become a reality: the new GLC Coupé translates the design idiom of the show car, with its distinctive basic structure and stretched greenhouse, virtually unchanged into series production. At the same time, the sports car among Mercedes-Benz’s mid-size SUVs impresses with its brand-typical safety, modern assistance systems and an especially sporty-dynamic character. The as-standard sports suspension as well as more direct sports steering, DYNAMIC SELECT and 4MATIC permanent all-wheel drive with 9G-TRONIC nine-speed automatic transmission combine effortlessly superior ride comfort with decidedly sporty agility. Two suspension variants with continuously adjustable damping are optionally available: the new DYNAMIC BODY CONTROL with steel springing as well as the already familiar AIR BODY CONTROL multi-chamber air suspension. Both options make for further enhanced driving dynamics and comfort. However sporty and aesthetically appealing, the dynamic GLC Coupé also impresses with some highly practical features. With a capacity of 491 to 1205 litres, the luggage compartment leads this market segment. And the availability of space in both front and rear puts the GLC Coupé on a par with the multi-talented GLC in terms of comfort. Entrance height, shoulder room, elbow room and legroom are all identical. In addition to 3-point safety belts with pyrotechnical and reversible belt tensioning and belt-force limitation for driver, front passenger and those in the outer rear seats, numerous airbags serve to protect the vehicle’s occupants in an accident. These include combined thorax/pelvis sidebags for driver and front passenger and an optimised windowbag extending over both seat rows, optional sidebags for the outer rear seats and a driver kneebag.